I had never met Michael Norman before he appeared for Authors @ The Teague, although I had read his debut mystery, The Commission, a fascinating look inside the Utah Department of Corrections. He is now on tour with his fourth book, Skeleton Picnic. Michael told the audience he had seven events in Arizona. He introduced himself as a recovering cop and college professor. He worked in Washington and then Colorado, so he could be a little closer to skiing. He was one of those people who kept getting degrees. He taught criminology at a junior college, and discovered he enjoyed teaching more than being a policeman. So, he went into teaching full time. Then, because he wanted to teach at the university level, he went on to get his doctorate in criminal justice. He spent the rest of his career teaching at Weber State University in Ogden, Utah. Eventually, he retired to write fiction. The Commission, Michael's first book, took him five years to write. He was lucky when he was searching for a publisher that Barbara Peters bought it for Poisoned Pen Press.He followed that book with the another in the Sam Kincaid series, Silent Witness. J.D. Books is the character is Norman's second series. Where did Books come from? When Michael was still teaching there was a job fair on campus, and he went to it to see what criminal justice agencies were represented. He recognized one man in a uniform for the Federal Bureau of Land Management. He was a ranger with them, and he had graduated from Weber State's program. He is now a Law Enforcement Ranger on the Arizona Strip. He invited Norman to tour Grand Staircase-Escalante National Monument in Utah. When Michael went there, he realized how easy it would be to die out there. It covers almost 1.9 million acres. Grand Staircase-Escalante was named a national monument when Clinton was President. There's a great deal of resentment of the federal government in Utah because they own so much land in ten western states. There is so much resentment that they had to dedicate the monument on the Arizona side because the Utah senators and other officials would not attend. The rangers cover remote areas, and Michael saw how alone a ranger is as a cop because the ranger arrested two drunk men with guns while they were out there. Michael spent three days there in Kanab, Utah. There is a lot of anger and hostility in the community. Norman realized this was perfect for crime writers. Community dysfunction works well with family dysfunction.The community has ranger types, along with hobby ranchers and environmentalists. None of them like each other. The Bureau of Land Management is a big presence there. Michael's ranger friend pointed out a family store where the federal employees won't even enter. He said the family that owns it hates the feds, and they're loud about it, so they weren't going to get even a nickel from the federal staff. When Norman wrote On Deadly Ground, the first J.D. Books novel, he gave Books a western sounding name. And, he intended the book to be a standalone. It's the story of a prominent environmentalist who is opposed to mining, timber, and cattle. He's at loggerheads with the people who have been in Kanah for generations. He goes hiking one weekend, and fails to show up for work on Monday. The man's body was found by a bunch of German tourists. Tourists come to Kanab because there were a number of Westerns filmed there. McKenna's Gold starring John Wayne was filmed in Kanab, as were some of the Gunsmoke episodes. The tourists in On Deadly Ground found the environmentalists body hanged. But, he had been shot, and the body moved. There was also a note saying this is what happens with environmentalists. BLM Law Enforcement Ranger J.D. Books works with the local sheriff on the case. 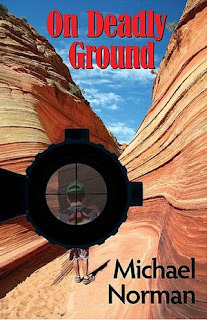 Michael's editor liked On Deadly Ground, and wanted him to write another book. He said it was a standalone, and he wanted to go back to the Sam Kincaid series. But, she wanted another J.D. Books mystery. Skeleton Picnic, the latest book in the J.D. Books series, is set in the Four Corners area. That's the heart of pot hunting country. There are Anasazi bones and pots. A baby's grave can be worth thousands of dollars. Michael told us he did more research for Skeleton Picnic than for any of his other books.He came across the term "Skeleton Picnic," and was told that was an old term. Generations of people grew up pot hunting in the Four Corners area. They did it socially and for recreation. Families and friends would get together on the weekends. They would have a picnic, and then pick up artifacts. That tradition was handed down, hence the title, Skeleton Picnic. In 1906, the Archaeological Protection Act made pot hunting illegal. It forbids the collection of artifacts on federal and tribal lands. Norman recommended a nonfiction book on the subject, Finders Keepers by Craig Childs.Childs said pot hunting is a four to eight billion dollar a year business. Collectors all over the world will buy the artifacts. Many pot hunters have the Indiana Jones syndrome. For them, it's more about the thrill of the hunt than the money. It's not illegal to possess artifacts. Some hunters will own a half million to three quarter million dollars worth of artifacts. If asked, they will say they've been in the family since before 1906, or that they got the artifacts off private land. 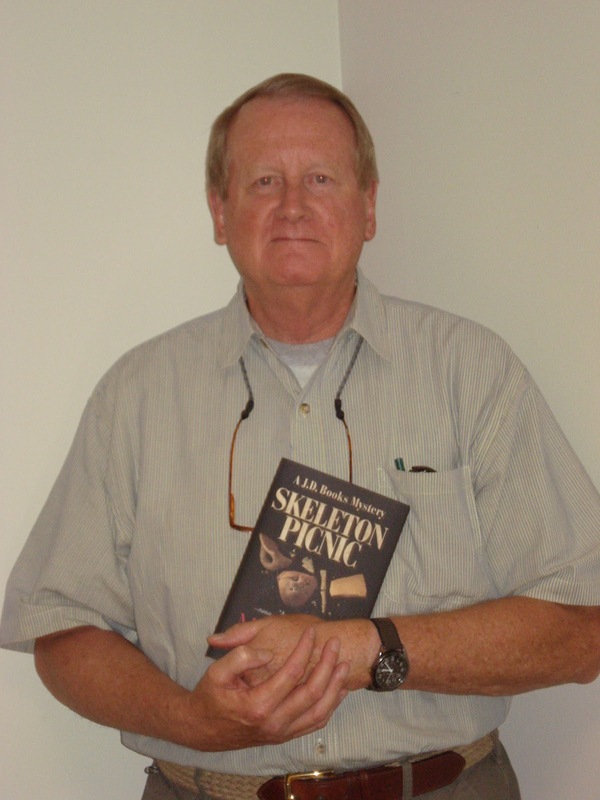 Skeleton Picnic is about Rolly and Abigail Rogers, a prominent retired couple. Their families have been pot hunters for generations. Spring and fall are the best time of year to do pot hunting. They set off for a trip along the Arizona Strip, and disappear. When the couple, religious Mormons, fail to show for church on Sunday, the police are called. J.D. Books has formed an alliance with the local sheriff, and they work together. In researching and writing Skeleton Picnic, Michael had to examine his own attitude. He tends to think like a copy. Everything is black and white. People are divided into good ones and "assholes." Cops tend to miss shades of gray. He had to think about the grey with this book. There are the mom and pop pot hunters. Then, there are the commercial hunters who come in with backhoes and rip the site up for commercial gain. There are not many clean hands when it comes to artifacts, including gallery owners and museums. Some gallery owners are not concerned with provenance. In doing his research, Norman came across a story about the University of Utah, and a professor in the 1920s who hired pot hunters so they would send the artifacts to the university. Nowadays, many of the pot hunters are dangerous. The commercial ones are certainly armed. A lot of the diggers are meth addicts. BLM calls them "twiggers," meth addicts who are diggers. And off terrain vehicles that cut new roads, just increase the ease and availability of land for pot hunters. Michael Norman has followed one case. In June 2009, the feds raided Blanding, Utah in the heart of Four Corners. The people there don't care for the federal government. They have a pot hunting tradition. The feds indicted twenty-six people from Blanding. They hired an informant who, over a period of twenty-four months, purchased 256 Anasazi artifacts. It cost $335,000, so imagine what they would cost if they were sold as individual pieces. The feds built their cases, and then raided the town with over 100 federal cops. There were terrible feelings afterward. There were three suicides. A prominent doctor killed himself after he was released on bail. The informant killed himself. Most of the twenty-six received probation, a fine and community service. So far, only one person got jail time. Skeleton Picnic is a fictional story built around a serious problem in the Southwest. Archaeologists go absolutely nuts about pot hunters. They document each artifact. However, there are a few crooked archaeologists as well. In 1990, a law was passed that allow Native American groups to seek repatriation of bodies and funeral objects. The Smithsonian Institute is said to have 18,000 bodies.Tony Hillerman wrote a book about the subject, A Thief of Time, featuring his two Navajo police officers, Joe Leaphorn and Jim Chee. In 1979, the feds updated the 1906 law. Jimmy Carter was President at the time, and he wanted to exempt arrowheads from the law. He had found memories of collecting arrowheads when he grew up in Georgia. Michael said he's back to Sam Kincaid in his fifth book. It will be called Slow Burn. Now, he'll probably alternate writing the series. He never intended to write two series because On Deadly Ground was meant to be a standalone. Asked how long it takes him to write a book, he said it doesn't take him five years since he's retired. His books are between 70,000 and 80,000 words. He has a writing goal. He tries to write five days a week, 500 words a day, 10,000 words a month. So, it should take him seven to eight months, but it probably takes eight to ten months since he might take vacations. Michael said writing has been a fun second career. He gets to make stuff up. You can't make up stuff when you're in academia. But, a friend who read most of his academic writing said that read like fiction. When he was asked if he received rejection notices, he said he had fifty rejection letters for The Commission. He thought he needed an agent, and fifty agents rejected it. You do need an agent for the large publishers. But, he submitted The Commission to Poisoned Pen Press in October, and he had his first response the following March. Barbara turned him down twice, and told him he had one more chance to get it right. She even gave him books to read, such as Dennis Lehane. As he finished, Michael told us he doesn't work with an outline. When he sits down to write, he looks forward to it, wondering where the story will go that day. Skeleton Picnic by Michael Norman. Poisoned Pen Press. 2012. ISBN 9781590585551 (hardcover) or 9781590586112 (trade paperback). Thank you, Karen. It was a fascinating presentation. It was so nice to meet Michael, and have the chance to host him for Authors @ The Teague. 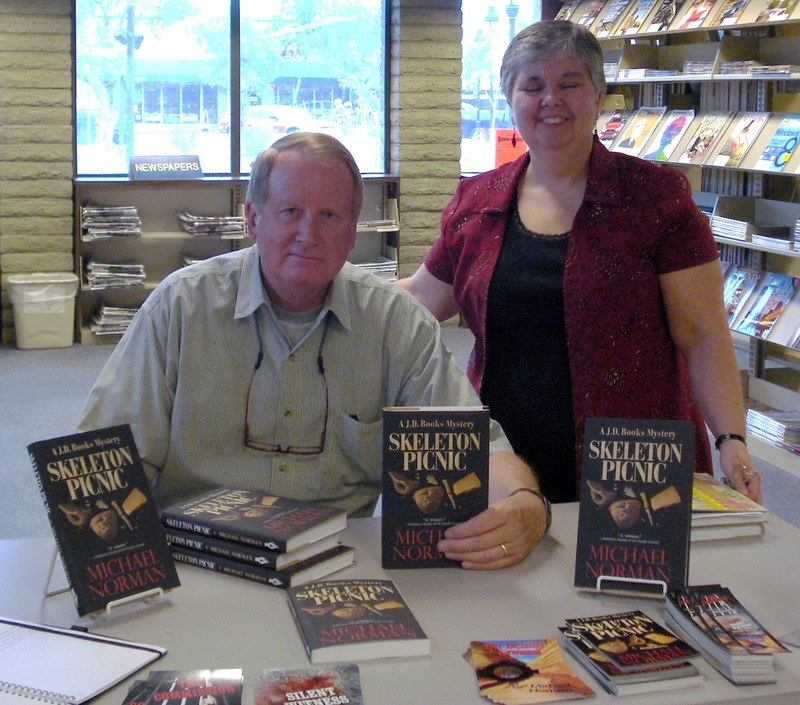 A fascinating look into the background and writing process of one of the very best writers of mysteries set in the Southwest. Michael's books are among my favorites. I just wish he would turn them out more quickly! When I was his dean at Weber State, he always got his work in one time. Cracks me up, Mike. I hope Michael sees that comment. On Deadly Ground by Michael Norman is thrilling murder mystery set in the surrounding area of Kanab, a small town in southern Utah. Former Denver police officer J.D. Books returns to his home town as a Bureau of Land Management Ranger and immediately gets caught up in a murder investigation. The story takes many twists when J.D. and Sheriff Sutter investigate the likely suspects and their motives. As the story unfolds there are also surprises both for the investigation and personally for J.D. The plot moves very quickly and the action doesn't stop. J.D. 's character is very likeable with a laid-back attitude and a past that haunts him. J.D. 's return to the place where he grew up added greatly to the character development as he interacted with old friends and family.